Size Mens Case Material Stainless Steel Dial Color Black Bracelet/Strap Rubber Black Clasp Type Push Button Foldover Clasp Movement Automatic Screw Down Crown No Bezel Fixed Crystal Scratch Resistant Sapphire Case Back Transparent Water Resistant 300m/999ft Case Diameter 47.5mm Case Thickness 15.75mm Perrelet a1067/1 Complete Details: A modern adaption of the Perrelet "Double Rotor". In addition to the traditional automatic winding rotor mounted on the back of the movement a second spinning rotor is visible on the face of the watch beneath the hands (the front rotor does not have any mechanical use & does not wind the watch - it is for design purposes only) . This watch design is inspired by aeronautical field & the front rotor depicts a turbine - hence the name. The Turbine rotor features 12 blackened blades above a completely luminescent backdrop dial. The free spinning Turbine rotor makes for a sensational optical effect. This watch features: Case: The case & the lugs are stainless steel with a fine satin finish & polished beveled corners. The bezel & case back are black DLC (Diamond Like Carbon) treated, which is highly Scratch-resistant coating. The bezel has a polished finish with matte finished 5 minute increments & the case back is completely satin finished. Completely luminescent striped backdrop dial Blackened finished hands filled with luminescent fill. Large polished steel central seconds hand. White flange with a printed black minute track. Rotating bezel: Located under the crystal. Bi-directional turning. Controlled by the screw-in crown located on the case edge at the 10 o'clock position. The diving bezel ring is mostly black with a 20 minute white diving zone. Luminescent 5 minute incremental markings for the entire bezel & luminescent minute markings for the diving zone. Crown partially recessed into case edge at the 4 o'clock position, with a small flip open lever to assist with winding & time change. 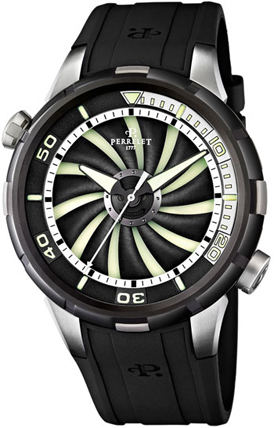 In-house Perrelet caliber P-331, beats at 28,800 vph, contains 25 jewels & has an approximate power reserve of 40 hours. Есть вопросы по Perrelet A1067/1 Turbine Diver?